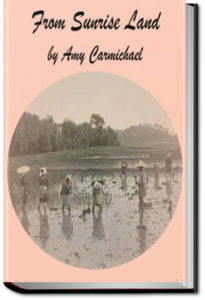 One of the most renowned of all Protestant Christian missionaries, Amy Carmichael is remembered most for the fifty-five years she spent doing evangelistic and philanthropic work in India. She began her missions career, however, with fifteen months in Japan before falling ill, returning to Ireland, and then returning to Asia with her focus on India. This collection of letters is a record of that time in Japan, and is fascinating not only for its biographical interest but also for its insights into the rapidly-changing life of fin de siècle Japan and the status of its small unpopular handful of Christian converts, in the same era when Lafcadio Hearn was recording his observations from a very different perspective. Far from free of racial and religious prejudice, Carmichael’s record is still heartfelt, revealing, and noteworthy in ways that she certainly would never have intended or expected.